The construction of the flood wall continues through Holcomb Gardens and up through Kessler Boulevard. Construction of a flood wall began this past summer, leaving a trench that currently cuts through part of Holcomb Gardens. The project may not be finished until August of next year. Approximately 2,400 hundred homes in the Broad Ripple, Warfleigh, Meridian-Kessler and Butler Tarkington neighborhoods will be protected by the wall, increasing property values and decreasing insurance costs for residents. However, this protection will not include the Rocky Ripple area and most of Butler’s campus. Ben Easley, a spokesperson for the Indianapolis Department of Public Works, noted that the project will also include the addition of a new multi-use trail along the length of the levee wall. “The multi-use trail has indeed been … included to preserve the community’s cultural connection to the canal corridor,” Easley said. As for Butler’s campus, the wall is expected to move through higher ground as it enters Holcomb Gardens. To do this, the wall will run along the east side of the gardens towards the bell tower. 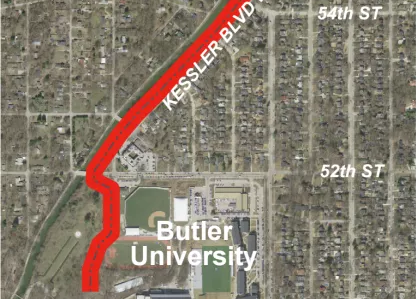 This means the construction will protect some areas of Butler’s campus from flooding, but only the areas behind the wall. The project has also necessitated the removal of 36 trees from the gardens so far, sparking controversy among those concerned about the beauty and environmental stability of the space. Margaret Brabant, chair of Butler’s political science department and a Rocky Ripple resident, is one of those people vocalizing their concerns with the project. Brabant has closely followed projects to build levees in Indianapolis for more than 20 years. She has noted significant losses in nature surrounding the two areas of Holcomb Gardens dedicated to philosophers and poets. Easley said the tree and brush removal was required for the project. While this is happening, another levee project is simultaneously being considered to be built along the White River. “The city, Rocky Ripple and Butler University agreed to a memorandum of understanding wherein they will work together to find the funds to help with the other flooding project,” Brabant said, also adding that the new proposed project could cost as much as $70 million in total. Whatever happens moving forward, the projects’ lasting impacts will only be fully known upon completion of the construction.